Both east and west of the Cascades, the landscape of Washington state is dominated by evergreen trees, mainly conifers, or cone-bearing trees. There are a few types of broadleaved evergreens, too, though these are restricted to the west side of the state, being less hardy than the conifers. Many of these make excellent garden trees if given conditions similar to their native habitat. The Douglas fir (Pseudotsuga menziesii) is the most widespread of all conifers in the area, common on both sides of the mountains, in dry conditions as well as wet. Its cones hang down, with three-cornered bracts between the scales. 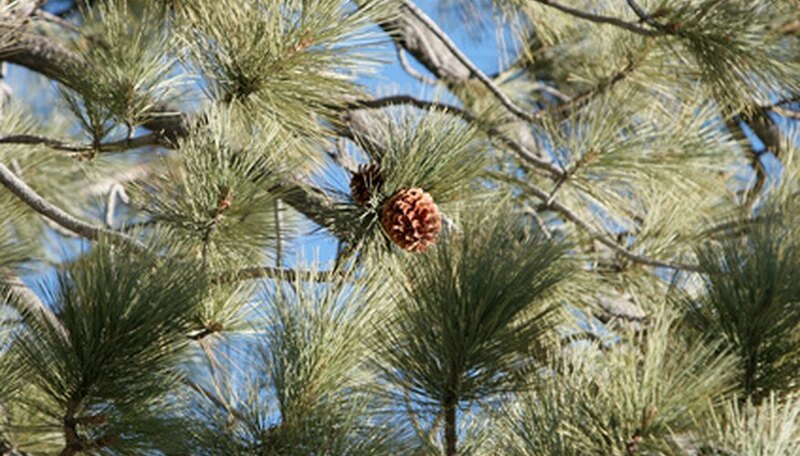 The true firs, Abies species, have cones that sit on top of the branches. These include the grand fir (A. grandis), silver fir (A. amabilis), noble fir (A. procera) and alpine fir (A. lasiocarpa), usually found at progressively higher levels of elevation. The western hemlock (Tsuga heterophylla) is a graceful tree with feathery branches. Its cousin, the mountain hemlock (T. mertensiana), is an excellent small tree for lowland gardens as well as those at higher elevations. The large, long-needled yellow or ponderosa pine (Pinus ponderosa) is found on the dry eastern slopes of the Cascades, where the lodgepole pine (P. contorta latifolia) is also found. A smaller, less rigidly straight variety of lodgepole pine called the shore pine (P. contorta contorta) is found on the west side. Two types of white pines are found in Washington: the Western white pine (P. monticola) and, near the treeline, the whitebark pine (P. albicaulis). Both are garden-worthy trees. The Sitka spruce (Picea sitchensis) is native to coastal regions, and the Engelmann spruce is a mountain tree. Several types of trees called cedars, a name often applied to widely differing plants, are native to the Northwest. The most common is the red cedar (Thuja plicata), which often grows in wetlands, though it's adaptable to most coastal soils. The yellow or Alaska cedar (Chamaecyparis nootkatensis) is more common at higher elevations. Both have needles that have been reduced to scales that are pressed closely to the twigs. Both Rocky Mountain juniper (Juniperus scopulorum) and western juniper (J. occidentalis) are found in Washington. They are small, tough and drought-tolerant trees. The western yew (Taxus brevifolia) is a shrubby, irregularly branched tree that can reach 30 feet in height, but grows quite slowly, generally as an understory tree in west coast forests. The fruit, technically a cone, looks like a bright-red berry and is mildly poisonous. The Pacific madrone (Arbutus menziesii) is a tough, drought-tolerant tree with shiny evergreen leaves and reddish bark. It's somewhat difficult to grow under ordinary garden conditions, but well worth trying if you have very sandy or gravelly soil and can protect it from summer watering. The golden chinquapin (Chrysolepis chrysophylla) is a relative of the oaks and chestnuts, and is rarely seen in Washington, being more common in California and Oregon. The dark-green leaves have a golden sheen to them, and the fruit is a spiny bur similar to the chestnut.